As you know, I DO shop mostly at the op shop, buying last year’s clothes and all … but I don’t want to be super uncool in my choices. I like op shop prices (and it’s good for the world to reuse and recycle) but I don’t want to look like I shop at the op shop necessarily (not that I won’t immediately tell you that I bought something second hand if you comment on my clothes or anything in my house – I just can’t help myself). So, to keep things relevant I present my not so secret weapon …ta da! 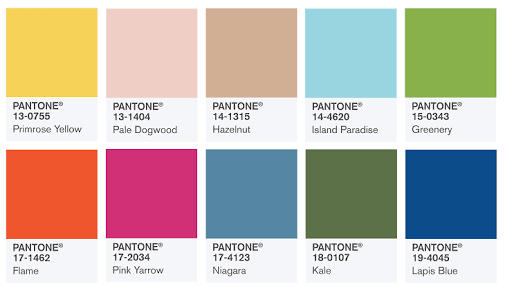 The Pantone colour chart for the year. 2017 here we go. ‘Greenery’ is the PANTONE COLOUR OF THE YEAR (and thus I predict that the home decorating trend for lots of plants inside is going to continue – go forth and buy that fiddle leaf fig I say). Anyway, now I am checking out this chart to get the vibe man … you know. I’ll keep that smokey mid blue colour in mind. I ❤️ blue. And I like mid greens and yellows. A bit of orange (yay I’ve got some great orange pants). And I like the combo of the greens with that lighter blue. Right, done. That’s it. I’m ready to go forth and rummage my way through 2017 with confidence. Today I present some nice green things. 1. A green office chair. I sit on this green office chair every day in my studio. I bought it at the tip shop (Outlook Environment Centre at Darebin tip) for $5. It is a great mid colour. And I love the industrial look of the chair. And the castors are cool too. It’s a bit lumpy, but suits me fine. 2. And my most favourite material in the whole world (I think) covers the chair I inherited from my great aunty. I really and truly love it. It is getting old and thin but I can’t bear to take it off and replace it. I am not attached to the chair in itself … it’s all about the fabric. I wouldn’t keep the chair without it. But while it looks somewhat respectable, I would never part with it. 3. A green ceramic dish. I just love the colour of this dish. 4. I think the dark green writing on this ‘dripping’ container looks pretty great with the aluminium of the container itself. 6. These celadon vases look a bit pale in comparison to the other green things, but they are a wonderful bluey-green and were given to us as a wedding present by Clive’s cousins and I really love them. I had trouble finding a home for them in my house for a long time, but then Elise gave me the green ceramic bowl/pot plant holder for our ‘second hand christmas’ one year and since then the vases and the planter have stuck together and filled various corners in my house beautifully.